In Breckenridge our grain facility can hold 3.8 million bushels of grain. We have a truck recieving capacity of 40,000 bushels per hour on 2 driveways and rail loadout capacity of 60,000 bushels per hour thru one central loadout. 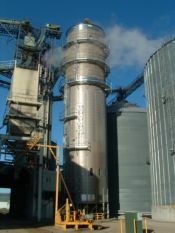 We have 2 - 7000 bushels per hour Zimmerman tower grain dryers and 190,000 bushels of wet storage in front of those dryers. The facility is completely automated and can be ran by one person at a workstation. We are located on the RRVW shortline railroad based out of Breckenridge MN and we have access the BNSF railroad network.